The City of Durham will celebrate its sesquicentennial in 2019, the 150th anniversary of its incorporation by the North Carolina General Assembly. In April, Mayor Steve Schewel appointed a small convening committee to assess the possibilities and make recommendations, chaired by Shelly Green, President of the Discover Durham and Patrick Mucklow, Executive Director of the Museum of Durham History. December 8, 2018 – Join us at the Durham holiday parade to officially kick off community-wide Durham 150 celebrations. Be sure to look out for the Durham 150 float which will feature past living mayors of Durham along with members of the Sesquicentennial convening committee and Durham 150 staff! April 13, 2019 – A large city-wide celebration is set to occur around the actual anniversary of Durham’s incorporation. Stay tuned for more information. The Durham 150 Website is Now LIVE! 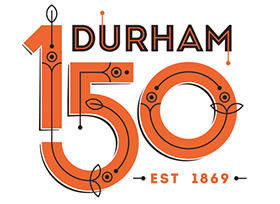 The Durham 150 website is live and can be found here. Kudos to Tobias Rose with Kompleks, designer of both the Durham 150 website and logo. The website and logo are a purposeful nod to our tobacco roots but also reminiscent of a circuit board, signaling Durham’s innovation and technology. Soon we’ll tell you how and when organizations and individuals hosting Durham 150 events, projects, and activations can use the logo, but for now, enjoy browsing the website! The opening ceremony event planning company has been selected after an RFP process where several fabulous companies submitted proposals. After a rigorous selection process, we are proud to announce The Special Event Company will be planning the Durham 150 Opening Celebration. Call-to-Action: We want all Durham residents, friends, and supporters to stay up to date on Durham 150 celebrations and events. Please forward this e-mail to friends, neighbors, and co-workers who wish to receive updates on Durham 150. Better yet, send them this form. No longer interested in receiving these updates? Feel free to unsubscribe in the footer.